The Magento course will train you to build online shopping websites for small-medium size businesses on one of the most popular, flexible, and easy to use and customisable ecommerce content management systems in the market. 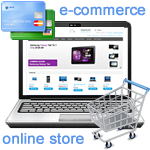 We provide one-on-one training and consultation services in the E-Commerce Website Design with Magento. The rate for individual training session is £25 per hour. Please contact us if you are interested. No previous experience of Web design, HTML, CSS is required. You should have basic computing and Internet knowledge.